Welcome to the Night Owls chatroom! This is for those who are awake late at night and simply can't sleep but still want to chat without having to have skype or switch tabs on another site to chat! // You can talk about anything, make friends, and blah blah all of that good stuff. Beware, the conversations zoom, you fall asleep and the next time you log in this is 5+ pages longer. If you're planning on joining this, then please recommend and subscribe to see when it gets a new comment! 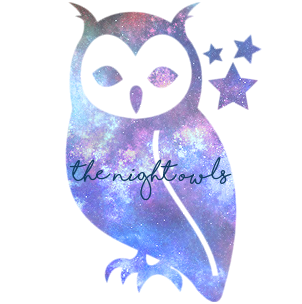 - the lovely 'night owls' badge was made by Ella! Hi, I'm Calli :) and I'm currently watching Ice Princess while trying to write to get something out before the 31st ends where I am! It's 2:34 AM here! Speaking of writing... I'm such a failure, I'm so upset that the writing cup happened this month, I've been unbelievably busy and had barely any time to sit down to actually write anything! I've only took my down time to check out 'My Mibba' page and recommend stuff. How are you? Up to anything atm? This is a brilliant idea! I'm pretty much always up ridiculously late. Like right now. It's almost 2am where I am and I'm sitting here making layouts for all my contest entries. This is such an amazing idea! It's really hard for me to get to sleep at night, so this will be a nice place to go to to speak with other night owls. Bless this! I'm Rylee! It's currently 4:41 AM and I'm watching silly YouTube videos and figuring out what to eat (not a lot of options at this time, lolol). Honestly, I started out really well with the writing cup and then life kicked me in the face and I kind of dropped it; however I was able to get two six thousand word chapters out for stories, so I'm proud of that. I haven't seen Ice Princess. Is it any good? oh my god, I'm so guilty of that too! I don't have my computer so I can't do a whole lot with that right now. The wifi isn't so great where I am, but since I'm the only one awake it's a little better, thank god. Omg I've made literally all my layouts from the last year on my phone and it's so time consuming. Same here! The post Ella has on the master list shows my word count slowly dwindling over the weeks and I'm screaming at myself in my head about it, but I can't be bothered to write anymore. I'm so burnt out, lolol. I totally feel you on the layout bit, though. I've made five layouts in the past two days and have no idea what to do with them. I keep entering contests and need new layouts and I'm like uuuhhhh I don't wanna do anything right now. im hoping I don't end up needing to drop any of the contests because im really excited about all of them. But man have I loaded up my plate. I don't even know where to start hahah. WHAT. How can you make layouts from your phone? I don't think I have enough patience to do that! Ice Princess is pretty good, a light hearted movie. It's also disney, so I'm sure you know how they are, if you like those kinds of movies, then you'll probably enjoy this! I tend to make them a lot when I'm bored at work and I have no access to a computer so I just adapted to making them on my phone. it does take patience though. I typically have to save them regularly before I go searching for new images in case my phone decided to refresh the page when I come back and mess it all up. Is Ice Princess that movie about the girl who like always got awesome grades but she really wanted to skate, and her coaches' daughter is Hayden Panetierre and she just wanted to be a normal teenager? I've honestly never tried making them from mobile I think I'm gonna give it a go sometime soon! I wonder if photobucket has an app *goes to check* there is! Yes, that's the movie! I just watched Aquamarine before, where JoJo and Emma Roberts befriend a mermaid I'm into watching movies like that when I write and want background noise. AHHH yeah I liked Ice Princess haha. It was a feel good movie. I love Aquamarine! it's been so long since I've seen it but I know I really liked it. omg yesss, I love them both I've been wanting to watch Aquamarine for a while but I always forgot about it. A few years ago I started a DVD collection and I left at my parents when I moved to the city and I just never grabbed them because it's in a big square case (ones where it's like 4 slots a page) and it's now filling up so the fam has claimed it and I just remembered when I was looking for a movie to watch. Canadian Netflix doesn't have a whole lotta selection, but there's this weird thing that happens, like whenever I buy an oldish DVD the movie ends up getting added to Netflix and now I'm kind of hesitating to buying Aquamarine. I completely understand. There are times where Mibba kind of goes into a contest lull and then everyone starts making awesome contest at the same time, so it's hard not to join them! I'm in the same boat. I would hate to drop out of any, but hoo boy, I'm entered in about fifteen by now? I do wish you the best of luck, though! I'll have to check it out! I adored Aquamarine because friendship and mermaids and it's been awhile since I've watched that one. I really just need to go and marathon all those movies, tbh. I do wish group writes were allowed to be apart of the cup, and I'm curious to know why they weren't. btw are you guys any good at story summaries? I have a story I want to post but I feel like my summary kind of gives away the plot! ZENON Zenon was my jam back in the day. I'm okay at summaries I'd be glad to help if you want someone to look it over though. Ugh I wish co-writes had been allowed to be included. I have a co-writer I've been working with for like a year and we update out stories like crazy so my word count would have been so much higher. and yes please omg, I'll send you a PM! We should probably ask why co-writes/group writes isn't allowed, lol, maybe because you share that story with another author? I don't know, ha. Ahhh, they played Twitches?! I loved those movies so much! I haven't watched Zenon, but I do remember seeing it around in the past. The Cheetah Girls was another fave of mine, though. I'm not too good at summaries unfortunately. It either use song lyrics or have a friend help me because I'm horrible In terms of the cup though, I'll probably end up sending Ella a message as to why group writes weren't allowed. I put one of mine on a temporary hiatus, but it didn't make sense to me as to why they decided to make it a rule. I mean, I understand that you're sharing it, but you still wrote some of the chapters, you know? I know exactly what you're talking about! I started reading the first one in the series, but I ended up getting really busy, so I didn't have time to leave a nice comment. I'll get around to it, though! You would've been rolling in the points if group writes had been allowed! Aw, well thanks! We kind of give up on getting avid readers because we update so often that people can't keep up hahah. I think we've completed like seven stories in the past year since we started writing together. I'd'be been roooolling in the word counts if I could include those chapters. you and Oliver both posted ridiculous words during the Cup though I was like "holy damn." Haha, yes Twitches was playing! I'm pretty sure they played Cheetah Girls too, I just didn't catch it! I remember seeing The Thirteenth Year, Motocrossed (which I watched ), but apparently they played all the original disney movies! I always thought I was pretty good at summaries, but apparently not I just read over the summary and I'm pretty much thumping my head. SERIOUSLY?? Oh my God that's the greatest thing ever! I didn't even think about downloading any of it, I remember having two Cheetah Girls songs, but other than that nothing. But I'm gonna head to bed now, I have to get up early to travel 9 hours! I hope you both have a good nights sleep!